I would like to wish my many good friends who are on Team PorcuBimmer the best of luck this weekend at the 24 Hours of LeMons! 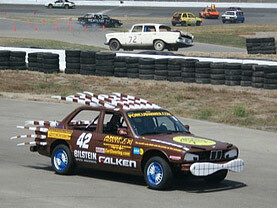 This is the second 24 Hours of LeMons my friends on Team PorcuBimmer are competing in. The last time around the clutch or something blew up, but while they were running they were one of the fastest cars out there. Hopefully this year the car will be able to go the distance! And what’s the deal with the porcupine theme? Well they say that this is the only BMW with the pricks on the outside. UPDATE: Team Porcubimmer ended up finishing 32nd out of 114 teams, completing 290 laps. Not too shabby! This entry was posted in Links of the Day. Bookmark the permalink. Both comments and trackbacks are currently closed.